Resorts are eager to welcome the new visitors, not only because numbers are so down this year, but because these tourists like to spend big on luxury goods like champagne and lobster. La Maddalena, an exclusive island in the Tyrrhenian sea off Sardinia’s northeast coast, is suffering the consequences of the economic crisis in its tourism sector. Among its guests this year there are Russians, Arabs and Kazakis to save them, but few Italians. At the Maddalena, the super-wealthy from these mineral-rich countries animate the streets, beaches and restaurants now, saving the charming island from sinking deeper in recession. Not even Italy’s rich and famous visit the island like they used to. Beach scene at La Maddelana beach in Sardinia. Photo by Bruno Cordioli. The economic difficulties from the global economic slowdown since 2008 has greatly affected the tourism sector. Swings in economic markers like that stock market make it difficult for the hospitality industry to predict the flow of visitors. 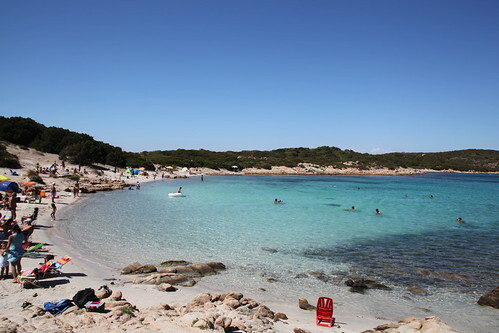 On La Maddalena the tourists dropped by 50 percent just between June and July 2012. “In August the situation improved and there are many tourists, but one can’t reduce a whole season to twenty days”, said the director of Porto Massimo Boats, offering sea trips to explore the island. This is too little a support for an island that waits — deserted in the winter — for the hotter seasons in order to show off its natural beauty. Although fearing the loss of Italians, hospitality managers cannot help smiling from the East’s nouveau-riche, to whom “we sell up to 70 kilograms of lobster a day, compared to the miserable 10 kilograms sold to Italians”, Andrea Orecchioni, the owner of the famous restaurant La Scogliera told Adnkronos. “Moet Chandon and Crystal, what else?” said Orecchioni. Something that doesn’t come as a surprise, as “La Maddalena has always been the island of the snob,” said Ernesto Massimetti, author of the “Manual for the glamour capital”. Orecchioni is one who managed to overcome the economic crisis by making the most of the foreigners, offering incredible services. “They call us from their boats, anchored up to 70 metres away from the coast and we go pick them up in our dinghies and take them to our private park where they are welcomed by a glass of champagne, followed by a great fish-based meal”, he explains. This year they are expecting to close the season with 25 percent of the incomes more than last year. (c)2012 Adnkronos International (Rome). Distributed by MCT Information Services.